Just because it feels like everything is marked down by a lot doesn't mean it actually is. Here's what's hype and what's real on the big shopping day. Sometimes the euphoria of shopping can lead to bad decisions. Black Friday may not exactly kick off the holiday buying season anymore, but it's still a time when people head out to stores with the intent of making major purchases. Stores are crowded, nearly everything is seemingly on sale, and it's easy to make a bad decision simply because a sign says you're getting a good deal. 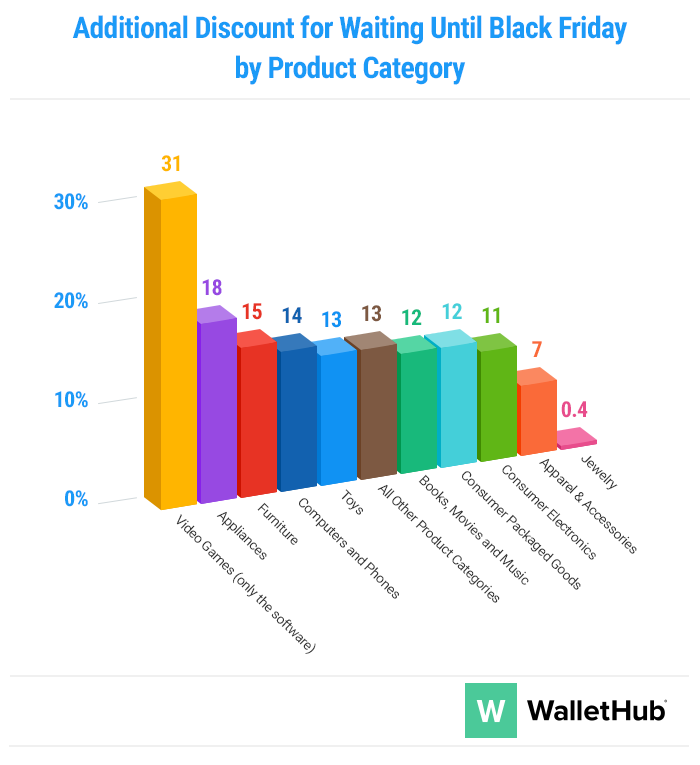 To separate myth from fact, WalletHub's number crunchers compared pre- and actual Black Friday prices of a broad selection of items. Using the price difference of each item, we isolated the offers that are truly worth the hassle of participating in America's biggest shopping craze. Of course, exceptions are always possible, so even in the worst categories, deals are possible. Still, if you hit the stores (or the internet) on Black Friday knowing these broad strokes, you will almost certainly save more or waste less money (depending upon how you look at it). Which categories are best and worst? As you can see above, it makes sense to wait to buy video game software on Black Friday above any other category, with deals reaching a 31% savings. The research also made a strong case for waiting to buy appliances, which will be an average of 18% cheaper on the big day, according to this roundup, and furniture, which will be marked down 15%. WalletHub collected items' advertised prices on Amazon.com between Oct. 19 and Nov. 17 and then compared those with the advertised prices in Black Friday ads. After video game software and furniture, the WalletHub numbers become a little more murky. Some categories that people traditionally buy on Black Friday offer solid, albeit less-than-you-might-expect savings. These include computers and phones (14%), toys (13%), and consumer electronics (11%). There are deals to be had in those categories, but consumers should be wary that savings may not equal hype. There is, however, one clear loser on the list above. It does not make sense to buy jewelry on Black Friday, according to this information, as prices will barely be reduced (0.4%) over any other normal day. Aside from giving a lot of video games as gifts while holding off on that jewelry purchase, it's also important to have a Black Friday plan. Amazon is not the only website you can check, but it's a good touchstone to use for price comparison. Identify the items you want to buy -- whether for yourself or as gifts -- and check their prices on Amazon and at one other retailer before leaving the house or hitting the internet on Black Friday. Knowing what an item costs before the shopping holiday lets you know whether its sale price is a deal or just marketing hype. It's also important to not get swept up in the shopping zeal on the big day, and to actually do your research. That could mean visiting multiple stores, price-checking online, or researching pricing trends for the items you want. Being prepared may take a little spontaneity and fun out of the Black Friday experience, but it should result in much less buyer's remorse. Remember that just because there appear to be deals, doesn't mean you actually have to buy in, and just because you want something now doesn't mean you can't wait until a more opportune time to make your purchase.